In honour of Freedom Day 2018, AfriDocs will make available for free streaming, the moving and powerful biopic: Oliver Tambo: Have You Heard from Johannesburg. Through this unique newly released film, viewers are given the rare opportunity for insights into the life, ethos and politics of Oliver Tambo, the leader of the ANC that was instrumental in bringing an end to apartheid. The streaming of the film that was only completed at the end of 2017 celebrates the 100th year of Oliver Tambo’s birth and could not come at a more opportune moment, with the entire southern African region focused on political upheaval and the toppling of established leaders and norms. Political comrades and law partners, Mandela and Tambo shared a political destiny. Nelson Mandela is a household name. 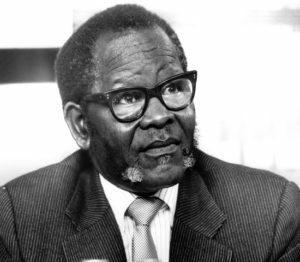 Oliver Tambo is virtually unknown. Banned in South Africa, Tambo led the liberation struggle in exile from 1960 to 1990 while Nelson Mandela was imprisoned on Robben Island. During those 30 years, he not only kept the African National Congress (ANC) unified, led his movement both inside and outside South Africa in a successful battle against apartheid, his calls to the international community to isolate and sanction the South African regime created the most globalised human rights struggle of the 20th century. In the end, his actions released Nelson Mandela and laid the foundation for a new South Africa. Suffering a stroke on the eve of success, OR would not live to see his lifelong friend become the first black president of a democratic South Africa.